There are no easy ways to answer these questions (except for the first: I’m cheap). Partially, it’s because the context for the game is personal for every person who plays it, but also because the game defies easy description. It has a standard RPG battle system, a rocking soundtrack, and a cool magicpunk aesthetic to it. That much is easy to describe. Yet it’s place in history at the tail-end of the 16-bit era means that it has a whole lot of giants upon which it rests. The game is one of two worlds. The first? An old-style JRPG that focused on statistics above graphics. These were/are games that utilized random battles, turn-based combat, and a healthy dose of the gamer’s own imagination to keep the illusion alive (unless it regrettably lapsed into FMV’s). The second? A more modern game that utilizes branching gameplay and non-linear storytelling. These put more “realistic” limits on how a game could play out, with avoidable combat and in-game storytelling that harnessed a different set of the medium’s toolkit. Both Final Fantasy VI and Chrono Trigger—arguably the two finest examples of JRPG’s ever, but radically different in their mechanics—were in development at the same time as FFVI. They would further develop these ideas in their own, better ways. Squaresoft hadn’t yet perfected the amalgam, but it was well on its way. It’s not that FFVI was unique, either. Final Fantasy IV had developed storytelling techniques for the 16-bit era. Square had already dished out diverging storylines, combined with mixed gameplay mechanics, with Secret of Mana (as well as Final Fantasy Adventure, SoA’s gameboy predecessor). Other companies had produced games that blurred the lines of the traditional RPG with novel concepts: Zelda II, Ys, and (oddly) Willow. They represent transitional species, if you will, between an older style and the modern action-RPG games of Mass Effect’s type. Is Final Fantasy VI just a fossil, then? Absolutely not. Leaving aside the argument that some people prefer turn-based/random combat, it is a stunning piece of gaming narrative that weaves a millennia-old mythology into bite-sized chunks of fun that leads down all sorts of fun. It is interactive. It is responsive. It allows you to do things at your own pace. It is the kind of game that I have always enjoyed, but now I am taking it in as an adult as opposed to what a ten-year old me would think. That is the true split. I can see how my younger self would have appreciated this game, even as my older self is experiencing it with a critical eye. I loved all of the aforementioned titles. I enjoyed them unconditionally. I didn’t look for the mechanics or for how the story works in three acts. I just went for it. Now that’s causing a bit of sadness. Artists aren’t supposed to just enjoy art. We can’t be consumers. We drive usage, and thus, the world. We must look at art in a context and with judgment. To produce work that is of lasting (or money-making) importance, we have to know a.) what the other guy/gal is doing, b.) what shifts these people portend, and c.) what is becoming derivative/old-fashioned. To do otherwise would be to fall helplessly behind, particularly as technology is making it ever easier to produce quality-looking content. The means of distribution is no longer in the hands of megaliths. YouTube, Amazon, and other sites allow for quick and (more importantly) cheap methods of getting content to an audience. It still takes a lot of legwork but it’s not a country club anymore. Good content can get on the market, as opposed to wallowing in slush piles. Good artists can hone their skillsets with constructive development and criticism, rather than play pretend while the big boys control the velvet rope. The new paradigm empowers younger artists… and also terrifies old-style producers of content. The unwashed masses are hurting the bottom line. The response? Bigger (read: bloated) budgets, flashier (read: gawdier) spectacles, and event-driven (read: sell it as quickly as possible before people figure out that it’s garbage) content that the small fry can’t match. It guarantees success… except when it doesn’t. One failure is now enough to bankrupt a company. Rather than use this experience or the decades of craft that they have developed, developers continue to push down the path to harder/better/faster/stronger. It could total the industry in an opposite way of the early-80’s crash. …no, wait. I won’t ruin it for you, either. My enjoyment of FFVI is, thus, on two levels. I am enjoying it with my boyhood self and also my artistic self. This is what great minds are capable of when the limitations force their imaginations to soar. It’s why the best art in the industry is now coming out of independent producers. That’s what’s causing the disconnect. It is not that Final Fantasy VI is of two worlds: it’s that I am. One part of me is an artist looking for inspiration. The other is simply absorbing inspiration through osmosis. For all of the work I’ve done, I still have held onto my innocence… somewhat. In other words, my soul still speaks with the voice of a child. God bless FFVI for giving that child some time to play. This entry was posted in 16-bit, game, Super NES and tagged art, Chrono Trigger, Daft Punk, Don Quixote, Final Fantasy, Mass Effect, Secret of Mana, Wii, Willow, Zelda by Steele. Bookmark the permalink. As far as I can remember, FFVI was the first RPG to allow you to formulate your own party. But I’ve long felt that the game’s greatest strength–the non-linear gameplay that comprises basically the second half of the game–is also its biggest weakness. While the challenge of recruiting (re-recruiting?) your characters after the apocalypse is engaging, there’s also very little story in the second half because you can recruit them in any order basically, after you get the airship. Which is unfortunate, because the first half of the game has a pretty tight story. On the other hand, while it often didn’t matter what characters were in your party for the story, it definitely mattered for combat. It made sense that Sabin, a big burly dude, would have the Karate/Monk skills, or that Strago, a wizened old mage, would have the Blue Magic/”Lore” skill. In too many of the subsequent FF games, the characters became extremely customizable (especially in the painful FFXII), making it irrelevant who was in your traveling group. 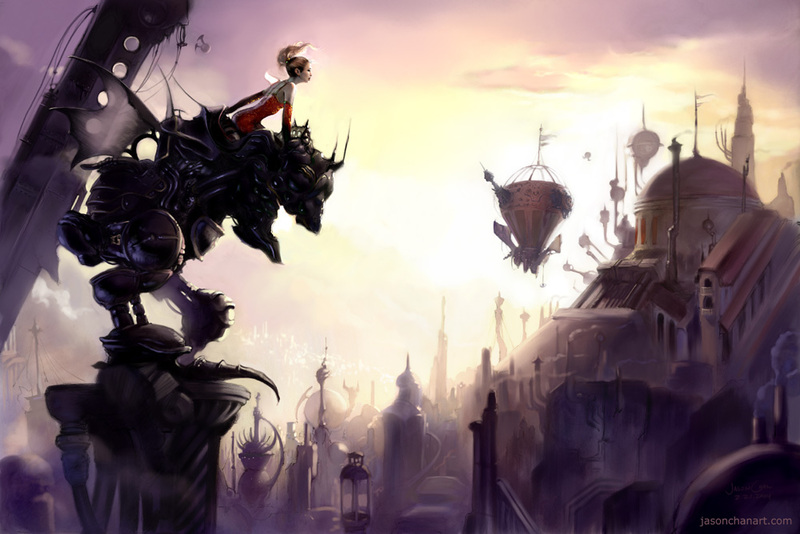 FFVI represents a wise balance of player choice within a system of givens that challenge the player to create the best party combinations and manage equipment wisely.